Barcelona has several beaches. 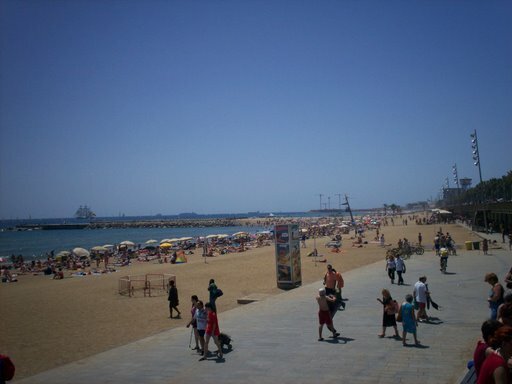 The most popular beach with tourists is the one at Barceloneta. It’s 2.5 km from Ramblas. The underground station at Barceloneta beach is Ciutadella | Vila Olímpica (Line 4). In 1992 the Summer Olympics were in Barcelona. The two towers (154m) on the picture were part of the Olympic Village. Nowadays one tower belongs to an insurance company (Torre Mapfre). In the other tower is the luxury Hotel Arts. Opium Barcelona is a famous beach club at Barceloneta beach next to the luxury 5-star Hotel Arts. Opium has the greatest terrace in Barcelona. At night it is the place to be for party’s with DJ’s and artists. Another club nearby is Carpe Diem Lounge Club (CDLC). Address is Passeig Maritim 32. A beer cost €7, cocktails and mixed drinks are €10. This is a list of their events. Visitors must be dressed well to get entrance to the clubs. Most people come after 01.00. To the underground Ciutadella | Vila Olímpica is a short distance. Hotels close to the Olympic Port are often luxury properties. The 5-star Hotel Arts is located next to Barcelona’s Olympic Port. Pullman Barcelona Skipper is also a 5-star hotel and lies next to Hotel Arts. Both hotels are overlooking the sea, port and Barceloneta beach. Residencia Universitaria Campus del Mar (1901 reviews, 7.8) is a good alternative if you are looking for a discount hotel near Barceloneta beach & nightclubs. The Residencia has studio’s up to 5 people. It’s 200m to the beach and 250m to the underground. Barcelona Yacht Apartment is a yacht in the Olympic port with 2 double bedrooms. A number of hotels are standing in the neighbourhood. 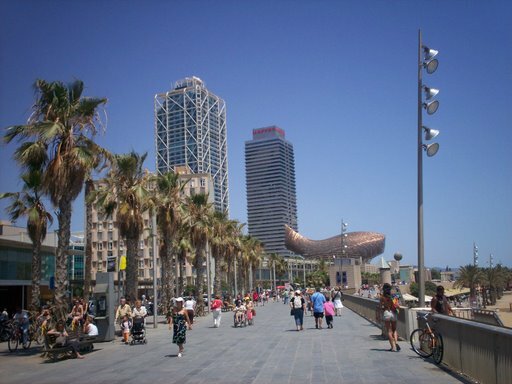 To Barceloneta beach is a 10-minute walk. The beach festival was july 16, 2016. The opening hours were 16.30 till 5.55 in the early morning. Well known DJ’s in 2016 were Nicky Romero, David Guetta, Axwell^Ingrosso and Paul Hardwell. Two of the most famous beach cities in Spain are located near Barcelona. The coast from the border with France to Barcelona is named ‘Costa Brava'(wild coast). The most popular beach resort at the Costa Brava is Lloret de Mar. The distance to Barcelona is 75 km. Lloret de Mar attracts in the summer lots of tourists on package tours. The gravel beach is not very special but the nightlife is one of the best. The mainly young tourists come from all over Europe especially from North- and Western-Europe. The coast below Barcelona is named ‘Costa Daurada'(Golden Coast). If you like sandbeaches then the Costa Daurada is an excellent choice. Most famous resort here is Salou which attracts mainly families. In the winter the average temperature is between 5-15 degrees Celcius. Many hotels on the coast are closed then. A few other tourist resorts on the Spanish coast are Benidorm (Costa Blanca) and Torremolinos (Costa del Sol, near Malaga).